Welcome to my Thanksgiving page! It may not be much, But I had fun doing this page. I hope you like it and have as much fun visiting this page as I did making this page. Thanks for visiting and enjoy! But first, The pros and cons of Thanksgiving! ~ A few days off from school or work. ~ A good way to leave town for a few days. ~ Food, Food, Food, Galore! ~ Always good things on T.V at this time of year. ~ Most of all, togetherness with family and friends. ~ NYC: A great place to be for the holidays and the Thanksgiving Parade. ~ If you're in high school or college, you still got research papers to do. And for those that just have one of those jobs that gives you 1 day off only. Bummer! ~ Holiday Travel: It is way too expensive & crazy to leave town for a few days around the holidays. ~ The cold weather, only if you are in the Northeast or Midwest. ~ The commercialism by Hallmark and others of Thanksgiving with Christmas yet to come. ~ Food, Food, Food, Galore (can be way too much, so watch the weight gain). ~ NYC: The hustle and bustle of people shoving and pushing during the holiday season. Especially the parade! When I was younger, the thanksgiving holiday was celebrated the way my history books had taught me. But now that I am older, and realize that I have some (a little bit) Native Indian blood, I know now that this holiday isn't much to celebrate. There is so much to be said about how this day really happened. About what really happened to the Indians. I've heard and read so many versions of different & the same stories. But these are stories that I may never find out the truth to. Will anyone know? Instead, this section I have made is to learn about our true owners of America before the explorers and pilgrims. The links below will direct you to Native organizations and personal homepages of our people. Visit and learn from modern Natives that voice and echo America's past. 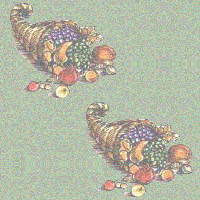 In This section, These are some links to other thanksgiving sites. Now, I know the last thing you wanna do is read boring stories from other sites, but some of these are actually fun with stories and recipies, games and all that holiday stuff. So take the time out to enjoy some of these sites.ok!? I will guide you through what's good and what's bad. Have Fun! The Truth About Thanksgiving.This is not for kids, But you MUST read this breif article. This site tells you one of the versions of the first Thanksgiving. Not that much reading, Fun & Educational. Another version of the first Thanksgiving. There is alot of reading material, but good site. Thanksgiving Backgrounds, for anyone who needs or wants. Cool site, this site has other things as well. I recommend this site. Good Recipies This place is cool! Stories,recipies,games,etc. Great site to visit, It's worth it. Stories, Games, Trivia,Etc. This site is cool, also good for kids. Create your Own ThanksgivingGood for kids & adults, try it! For Kids Only Good for Kids Only! For All Holidays This is an Interesting Page, it has everything. Recipies, Craft Projects, Etc. I like This Page. HappyThanksgiving.com This is a Gov't Based Page. WarnerBros.Thanksgiving WarnerBros. is always a fun page. Visit it. NYCTourism.com parade on-line. Better to go here for updated features of this year's T-day parade 2001. To me Thanksgiving is a time of togetherness with Family and friends. It is also a time when people should apprecitae other people whether it's inside of their family or outside, whether it's within their race or outside, we should remember to give peace to all kinds, all days of the year. We must also say thanks to our Lord for giving us everything we have recieved. I would also like to commemorate the Native Americans. For this is a hard holiday for them due to the fact that many of their people were betrayed on this day forward. So not only do I celebrate the history of this day, but I celebrate the lives that were lived and gone of the past ancestoral tribes. God Bless them!!! Have A Happy Holiday!!!!!!!!!!~FIREBIRD!!!!!!!!!!!! I would like thank Holiday Village for the beautiful background, and for the images there are multiple places i would like to thank, such as: Kelly& Musens Graphic Boutique, Mama bear's pic library, Tigger's clipart. All can be found atWebClipArt.I would also like to thank Gif Animation Archive, for the wonderful animated guy eating dinner. If you wish to pay Tribute to native Americans and want to build a site based on their background, you can either goHERE or you can try this site over HEREAnd last, But never the least, where I got the image of the Indian corn at the end to take you home came fromMarthaStewart's Website. Thank You for your time to visit, Enjoy!!!!!!!! And remember, try not to Over Eat!!!!!!!!! At Leat Not Like Him, OK!!!!*LOL*Bye!!!!!!! Or see the Holiday Page! Sorry for the poor taste in music, will try to find a better one ASAP. Thanks for your patience.